I have been scouring websites and blogs and travel info and have compiled a list of places I want to visit and things I want to do and see. Here it is…. http://www.heidishouse.net/308/about/ an UES restaurant to try with mac and cheese, burgers and chocolate soufflé, no reservations but you can call ahead…. At Hudson Eats…What to order: Northern Tiger’s juicy handmade lamb dumplings, slick with spicy sauce ($8). for soup pork dumplings Delivery??? What is at New York City center. La bonbonnerie. West 12 and 8 av. Cash only old soda fountain. 59 east 59 theatre. Between park and Madison. Love theatre? Although pizza is New York City’s unofficial food giant, the city is also known for some of the finest bagels in the country. Your food options may be overwhelming given the street vendors on every corner but it is best to draw up a plan: start your route in Murray Hill and work your way into Stuytown. A must-try in Stuytown is breakfast at Ess-a-Bagel on Third Avenue. The most efficient way to get around is on food – it will also help work off those carbs. There are a surprising number of top quality vintage and antique furniture shops finding a welcoming home in Bed-Stuy. They rival the best of Manhattan’s stores with the added bonus of a (slightly) cheaper price tag. A treasure only found in Bed-Stuy is the man behind I Like Mike’s Modern and Midcentury. He expertly refurbishes and completely restores beautiful pieces of furniture in his historic brownstone home. Bed-Stuy has a ton to offer the hungry tourist. After walking through the brownstones and checking out the random stores spread through the streets, it’s great to know just how many options there really are. Hit up Black Swan if you are in need of some amazing Bloody Marys loaded with toppings or just some classic American food. If you want first-rate Italian cooking look no further than Saraghina. Bed-Stuy is also home to some exceptional Southern cuisine, and Peaches is a local favorite. Transformed warehouses and industrial spaces give way to a slew of some of the world’s best galleries within a 10 to 15-block radius. Chelsea is the neighborhood to be in for art lovers, and on most weekdays it is home to dozens of gallery receptions that are open and free to the public. For a complete experience, two stops to make are the Jonathan LeVine Gallery and the Gladstone Gallery. The first showcases artists who are inspired by early graffiti and comics while the other features minimal and conceptual art installations. As vintage makes its comeback into modern society, flea markets are the place to go. HKFM, open year round Saturdays and Sundays, is a great place to find cool little gadgets, old records, fun clothing, quirky furniture, jewelry, and so much more. Go with friends or fly solo and explore everything this market has to offer. There are a good number of stands, allowing for maximum browsing. Maneuvering through the crowd can be a bit frustrating at times, but with a bit of patience (and luck), you can find a nice little treasure to take home. The only thing better than eating fresh produce is picking out the produce yourself. New York City is home to a plethora of different food markets, many stemming from Greenmarket, a network of farmers’ markets in the city. Their goal is to bring city residents a taste of freshness while giving business to local farmers. There are over 50 markets throughout the boroughs including one in Union Square and Williamsburg. The days vary by market, so check out their blog for information on events, and weather announcements. Travel across two boroughs via the Brooklyn Bridge. It offers great photo ops of downtown Manhattan and DUMBO. There are separate lanes for bikers and pedestrians, which clears up a bit of the congestion. This is an ideal place for a mid-day date or just a day out with some friends. For those who might be afraid to cross the bridge, the Brooklyn Bridge Park is located below the bridge on the Brooklyn side and offers the same breathtaking views of lower Manhattan. 15. You are well aware of all ‘buy a drink, get a free dinner’ bars (Crocodile Lounge, Merrion Square, Rudy’s Bar & Grill, etc.). Tribeca, one of New York City‘s original residential neighborhoods dating back to the 1700s, has since transformed into an industrial and commercial hub, attracting a wide range of families, emerging artists, and even celebrities to enjoy its countless amenities. The downtown neighborhood’s lively bars, lounges, and fine-dining venues are highly frequented as well as its many galleries, museums, and cultural centers, which offer a balance of education and pleasure for local residents and tourists. Takahachi Bakery, a Japanese eatery, is located in the heart of Tribeca and offers all sorts of treats to satisfy your sweet tooth, with a penchant for foreign delicacies. Orange and cranberry scones, miso almond cookies, black sesame macaroons, olive rye wasabi buns, and chocolate French baguettes place a creative, tasty spin on classic pastries! Kashipan, souzaipan, and shokupan are breads stuffed and topped with all manner of toppings, including more traditional options like lemon, banana custard, black sesame, multigrain cream pan, and peanut butter crunch, plus more daring choices like beef curry yaki, Hawaiian pizza, rabbit, and edamame with cheese! For those wishing to indulge in a more filling meal, hot and cold sandwiches as well as appetizers and salads are also freshly prepared and served on the premises. Poets House is a national poetry library and literary center that invites poets and all visitors to attend readings, conversations, workshops, and classes and to enjoy and appreciate one of literature’s favorite genres. Poets House annually presents a wide array of public programs, including seminars, performances, and even walking tours featuring poets hailing from all across the globe — this gives visitors the opportunity to cherish works from all different cultures and nations. Their signature program series, otherwise known as Passwords, focuses on one particular poet’s close exploration and enthusiasm for another’s work, which in turn offers a brand new perspective in a refreshing, intriguing manner of analyzing poetic masterpieces. The exhibitions presented at the library are ever-changing, and Poets House is currently featuring the works of painter and book cover designer Trevor Winkfield whose portraits and drawings span a 30-year time period and who has connections to reputable poets such as Harry Mathews, Larry Fagin, Charles North, Barbara Guest, and Miles Champion. DUMBO is a small Brooklyn neighborhood that lies at the cusp of Brooklyn and Manhattan. This location gives DUMBO its name, which is an acronym for ‘Down Under the Manhattan Bridge Overpass,’ and deems it a great spot to view the Brooklyn Bridge and the East River. DUMBO also has a vibrant art scene and mouth-watering cuisine. We bring you a list of the 10 best things that DUMBO and the surrounding areas have to offer. Whether you are looking for a patch of green to lie on or a scenic view, Brooklyn Bridge Park is the perfect place to relax. This park features a variety of piers where visitors can overlook the water and of course, the Brooklyn Bridge. Once a week during the summer, park-goers can try the tasty foods served at Smorgasburg, an incredible outdoor food market that takes place in different locations throughout Brooklyn. There are sometimes movie showings in the summers, and the park is known to feature unique art installations. This park is a fixture of Brooklyn and a must-visit. With its fresh food and beautiful, open atmosphere, Atrium DUMBO is a seasonal French-American restaurant that is worth a visit. This unique restaurant describes its food as ‘fresh, market-driven cuisine coupled with classic European technique.’ There is a beautiful vertical garden on one wall of the restaurant, while the downstairs area has a stunning view of the water. If you’re in DUMBO, this is one place you need to go to take in a relaxing ambiance while you eat and drink. Like many New York neighborhoods, DUMBO is known for its incredible art scene. One way to immerse yourself in this world of innovative art is to head to A.I.R. Gallery. Founded in 1972, A.I.R. was the first all-female cooperative gallery in the United States. To this day, the gallery continues to feature emerging female artists, exhibiting the work of hundreds of talented women each year. This one-of-a-kind gallery also hosts many events, lectures and symposia on feminism, art and much more. Well known for its exquisite desserts, Jacques Torres Chocolate DUMBO is a well-renowned place to get dessert. In the winter, Jacques Torres Chocolate fills with customers lined up for exceptionally rich and creamy hot chocolate. In the summer, you can enjoy the delicious handmade ice cream at Jacques Torres Ice Cream, located right next door. For a delicious treat that never goes out of season, the chocolate chip cookies at Jacques Torres are a must. No matter the time of year, Jacques Torres is the place to go for out-of-this-world chocolate and desserts. The groundbreaking art of DUMBO isn’t only found in galleries. If the installations in Brooklyn Bridge Park have you craving more outdoor art, you’re in luck. Unique street art adorns many outdoor walls in DUMBO. If you’re searching for the most awe-inspiring street art, you’ll want to take a look at the murals under the Brooklyn-Queens Expressway, or the BQE. 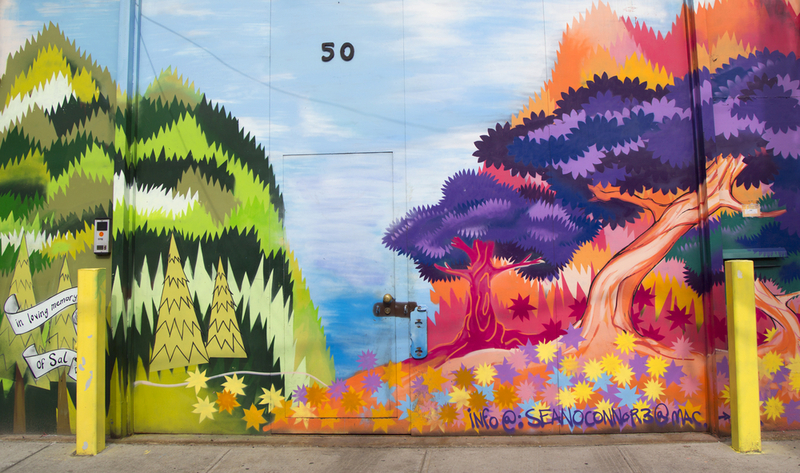 There you will find DUMBO Walls, a series of eight outdoor murals packed within a four-block stretch of DUMBO. Attracting creative people from far and wide, The POWERHOUSE ARENA is a gallery, boutique, bookshop and space for performances and events. The POWERHOUSE ARENA was originally founded in the Fall of 2006 by world-renowned and critically acclaimed art book publisher, powerHouse Books. The venue has a staircase that leads to the Arena Sky Lounge, a multifunctional gallery, V.I.P. lounge and green room, which is also home to a wide selection of books. Whether you want to see an art exhibition, grab a book, or attend a unique event, the Powerhouse Arena is more than worth a visit. People come from all over the world to visit and explore New York City’s past and present, and the Meatpacking District is anything but out of date. The historic neighborhood, once home to roughly 250 slaughterhouses and packing plants, is now the cultural hub of some of the trendiest shops, restaurants, bars, and art Manhattan has to offer. Whether you’re spending a weekend or more, here are the ten can’t-miss stops for this area. The High Line is arguably the best example of historical preservation in this area. What was at one point a section of the New York Central Railroad, known as the ‘West Side Line’ is now still a method of sight-seeing and transportation for thousands of tourists and residents thanks to the nonprofit group, Friends of the High Line. The railroad-turned-park, which stretches from Gansevoort Street to 34th Street, is an incredible experience allowing visitors aerial views of the city, lawns and benches for relaxation, an escape into beautiful greenery, and some exercise. Perfect during the day and night! Dessert-based goblets and martinis, homemade milkshakes, and chocolate covered pancakes, oh my! This spot appeals to adults and children alike, and is a perfect breakfast stop for the entire family. Under 21? No problem, all of the restaurant’s goblets are available as both alcoholic and non-alcoholic beverages. Don’t exactly have a sweet tooth? Enjoy some of The Sugar Factory’s other delectable breakfast, lunch, and dinner specials which cater to both omnivores and vegans. This unique American Brasserie is outdoing Willy Wonka one S’mores Crêpe at a time! Be sure to book reservations a week in advance. Feeling hungry during your New York escapade? Satisfy that hunger at Bubby’s where walk-ins are welcome. Bubby’s is a popular addition to the neighborhood, and the restaurant prides itself on its use of top notch ingredients to create incredibly delicious cuisine. Top off breakfast, brunch, lunch, or dinner by heading back in time to the roaring ’20s with Bubby’s homemade ice cream, milkshakes, and sodas from their signature Soda Fountain bar. Dare-devils may want to attempt attacking The Kitchen Sink special, complete with 16 scoops of ice cream, multiple syrups and toppings, and a cherry on top for good measure! New York has always been recognized as a dwelling for the arts, and people come from all of the world to experience and admire the plethora of shows, galleries, and, of course, museums the city cultivates. The Whitney offers a refreshing collection of art, with a focus on contemporary 20th and 21st century artists such as Edward Hopper, Jackson Pollock, and Robert Henri. Whether you’re an art guru or a passive admirer, the more than 20,000 paintings, sculptures, photography, and films, not to mention the outdoor balcony with spectacular views of the neighborhood, are sure to take your breath away. Some really spectacular and unique things happen at Milk Studios. This is definitely a spot to explore for the fashionistas out there. Milk Studios fosters the creative individual, offering their photography studios as a location for galleries, exhibitions, and various other fashion and charitable events. If you’re in the Meatpacking District, there’s bound to be something interesting to check out at Milk Studios. Tickets for public events in the penthouse are typically pretty affordable online and make for a fun and exciting night. It’s impossible to come to New York without doing at least a little bit of shopping. Whether you’re looking to purchase or casually stroll through, this urban shopping mall has everything you’d want to see from groceries to flea markets. Walk through Chelsea Market to experience tons of amazing shops, culturally diverse restaurants, and dessert stops like Artist and Fleas, Beyond Sushi, and Doughnuttery (just to name a few). This is a great place to snap a picture under an archway lit with thousands of white string lights, grab a bite to eat, and/or buy creative knick-knacks and memorabilia. Gansevoort Market is a refreshing piece of history still standing and serving almost the same purpose it did in the late 1800s. 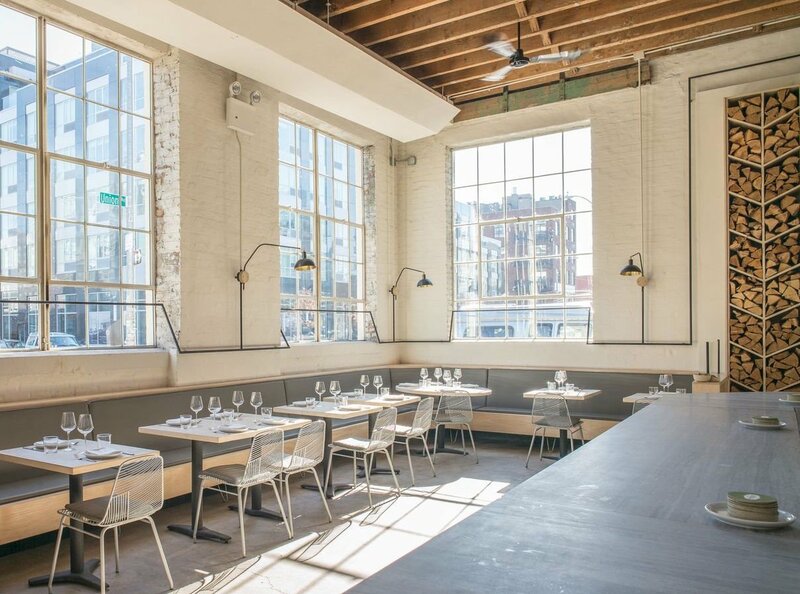 Though the outside has maintained its old-style industrial look, the inside has been modernized complete with picnic tables and a sunroof that allows beautiful natural light to stream in and illuminate all Gansevoort Market still has to offer. Stop in for a great cup of coffee, enjoy some baked goods from Dana’s Bakery or The Bruffin Café, or stock up on the market’s incredible fresh produce to make your own delicious meal. 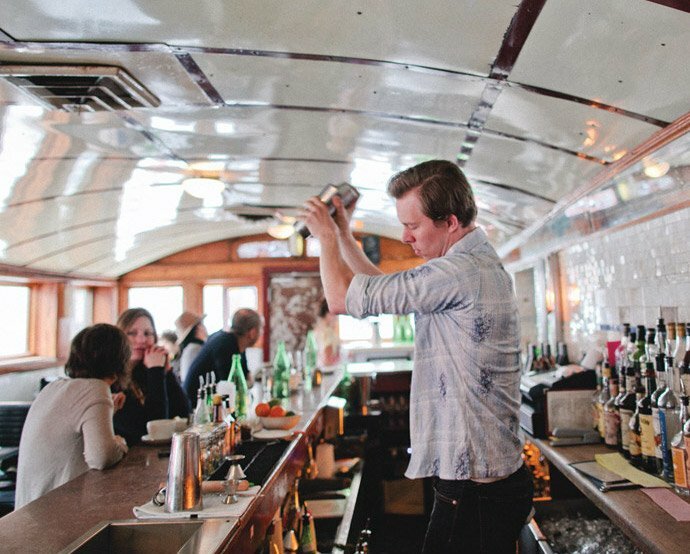 Located in a metal dining car from the twenties underneath the Williamsburg Bridge, Diner is must-have Brooklyn experience. The servers scribble the small New American menu on your paper tablecloth. 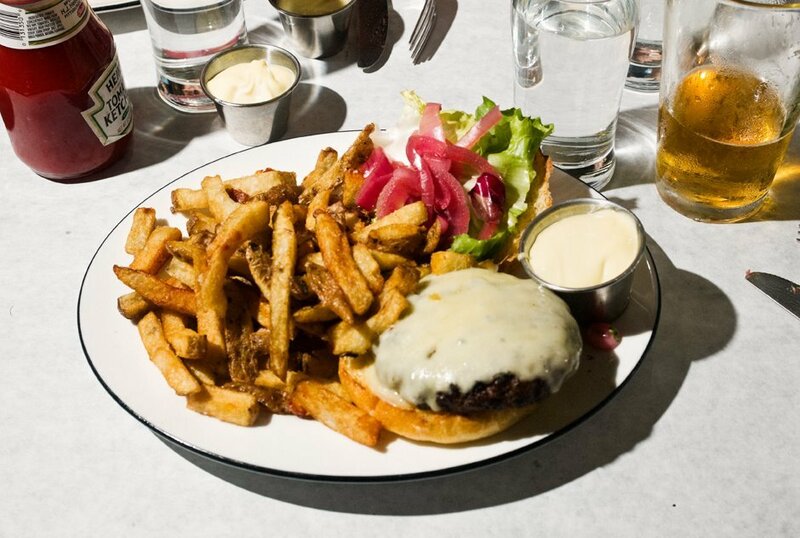 Order a grass-fed burger and fries (hotly debated as the best in NYC) and a crisp salad. The greens are so fresh, they taste like they were pulled from the ground seconds ago. No reservations are taken, so try to snag a seat right at 6 o’clock. 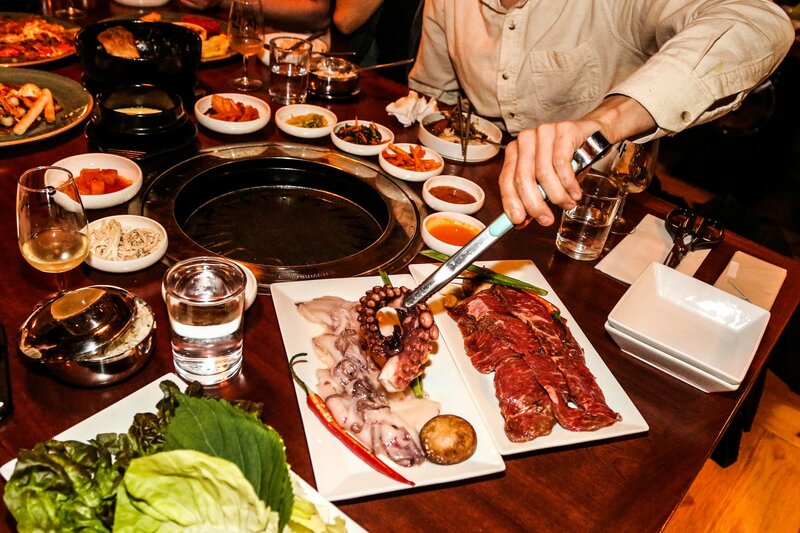 Insa, housed in a former warehouse, serves Korean barbecue and noodle dishes (think: marinated beef short ribs, dumpling soup and seafood corn dogs!). But the real draw of this spot are the crazy karaoke rooms, with themes like the jungle, deep sea and space. Rally a group of friends to belt out “I Will Survive” over tiki cocktails after dinner. 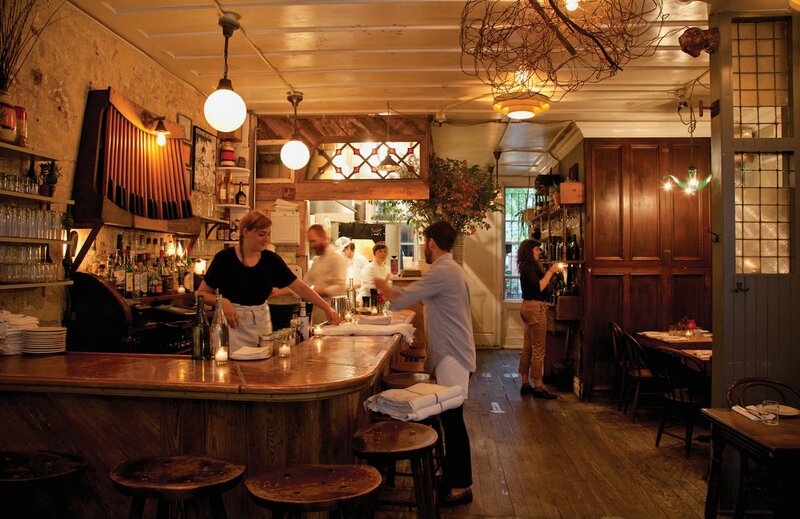 Vinegar Hill House is tucked away on a cobblestone street in this small neighborhood just north of Dumbo. The farmhouse decor feels authentically homey (there’s a wood-fired oven, flickering lanterns and vintage wallpaper), and the menu is filled with gems like buttery skillet cornbread and oh-so-tender pork chops. Make reservations to guarantee a table; and if it’s warm outside, dine in their quiet garden under a cherry tree. 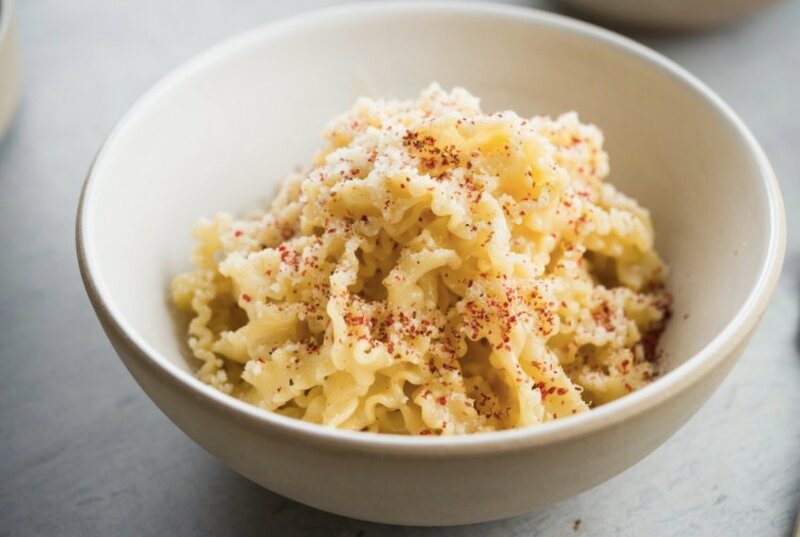 Lilia makes Williamsburg feel like Italy for a night with their hand-crafted pastas and bold wines. Order the mafaldini with parmesan and pink peppercorns (the best twist on caio e pepe that I’ve ever had) or rigatoni diavola (with San Marzano tomato sauce and chilies). Make reservations a few weeks in advance to secure a spot — this is not Brooklyn’s best-kept secret. An easy train ride from New York City, Beacon is an up-and-coming artist community that has successfully risen from the ruins of post-industrial decay. The indisputable hub of Beacon’s cultural revival is Main Street, with many of the city’s unique attractions lining its easy-to-stroll, one-mile span. Both its location in the Hudson Highlands and proximity to the Hudson River also makes Beacon an exceptional destination for those who love the outdoors. One of the more convenient and fulfilling ways to take in the splendors that Beacon has to offer is Beacon Arts’ Second Saturday, a citywide celebration of the arts held the second Saturday of each month. The festivities, which feature gallery exhibitions, music, food tasting, and more, continue all day and well into the night, making it one of the Lower Hudson Valley’s most talked about street fairs. Of particular note is the fact that most of Beacon’s countless galleries schedule their exhibition openings to coincide with Second Saturday. What distinguishes the Beacon Flea Market from other sizeable flea markets is a strictly enforced requirement that all merchandise be either handcrafted or authentically vintage, absolutely no knock-offs or brand new mass-produced items allowed. Every Sunday from April through November, weather permitting, vendors share their crafts and wares among the market’s more than 50 stalls, which line the Henry Street parking lot, located behind the Main Street Post Office. Sleuths in search of the rare and unusual will revel in the treasures waiting to be discovered within the tabletops and bins and clothing bars on display. Be aware that most vendors accept cash only.